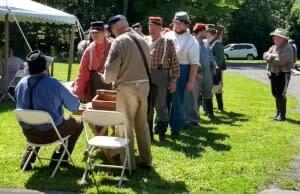 Massena, N.Y. - Yanks and Johnny Rebs will be at it again during the St. Lawrence County Historical Association’s annual Civil War Reenactment Weekend at Robert Moses State Park, Massena. The sights and sounds of the Civil War will fill the air at the 17th annual Civil War Reenactment Saturday and Sunday July 28-29. The event is sponsored by SeaComm Federal Credit Union, with additional support from Niles Asset Management, Stewart’s Shops, A#1 King’s Buffet of Massena, St. Lawrence Federal Credit Union, Jock Pest Control, the Blue Spruce Motel, AMVETS Post #265 (Parishville), and VFW Post 6338 (Gouverneur). The military camps are open to the public from 10 am to 5 pm on Saturday, and 10 am to 2 pm on Sunday. Mock battles will be at 3 pm Saturday and 1 pm Sunday. Closing ceremonies will follow the Sunday battle. The Marine Corps League, St. Lawrence County Detachment #408 provides a food concession both days. The Historical Association is a membership organization open to anyone interested in St. Lawrence County history. For more information, or to become a member, contact the SLCHA at 315-386-8133, e-mail info@slcha.org, or on the web at www.slcha.org. Photo Caption: Soldiers line up for their pay at last year’s Civil War Reenactment Weekend. Don’t miss St. Lawrence County Historical Association’s 17th annual Civil War Reenactment, Saturday and Sunday, July 28-29 at Robert Moses State Park in Massena, sponsored by SeaComm Federal Credit Union. Contact: Sue Longshore, Executive Director, St. Lawrence County Historical Assn.